A collaborative project between LSBU and others involved in mental health provision will play a key role in improving the lives of the thousands of people who live within the UK’s psychiatric institutions. With a colleague at the University of Leicester, Professor Reavey has developed a number of projects to examine design and space in institutions, and both are working as honorary research consultants for St Andrew’s. A component of this work also involved mentoring a mental health and space PhD student project, which in turn sparked a follow-on study that looked at people now living outside of hospitals but who had previously been service users. 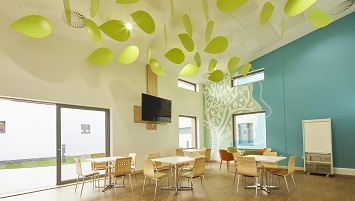 Mental health-oriented institutions have historically been designed without much examination of how the built environment influences how service users feel in those spaces … the focus of this research is how inpatients live within confined and secure spaces, or psychiatric institutions. “Work of this nature is obviously very sensitive due to the need to gain access to secure forensic psychiatric provision, which is always a challenge, especially when using visual methods as we do,” adds Professor Reavey. “There are also a number of ethical challenges, such as gaining NHS ethical approval for research and working through a variety of security measures in these types of settings, but we have managed to submit five papers relating to the mental health hospital project alongside a commissioned systematic literature review (by Design in Mental Health Network UK) and a book, Mental Health and Space: Clinical and Community Practices. “I have now secured funding to continue this work and help inform the work of designers and architects, as well as hopefully influence other related areas such as prison design." Professor Reavey will advise St Andrew’s on the development of a new, multi-million-pound centre for mental health. It is hoped that the work undertaken will also inform and influence “castle geography” – prison architecture. Professor Reavey is a Director for Design in Mental Health UK and has been awarded funding to develop a research repository and brochure. Professor Reavey has also been awarded funding from St Andrew’s to carry out a research project on memory and confinement in psychiatric institutions.